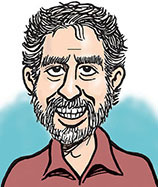 Steve Greenberg is an editorial cartoonist and artist in Southern California, drawing regularly for the alternative-weekly Ventura County Reporter, the Jewish Journal of Los Angeles and other publications and websites. His Jewish cartoons are self-syndicated nationally while his overall work is distributed via PoliticalCartoons.com and CartoonStock in the U.K. He regularly contributes to the Cartoon Movement (originally called the VJ Movement) out of The Netherlands and was the first American cartoonist invited to join. He is also an award-winning informational graphics artist and illustrator, and draws a monthly comic strip, "Boomerish," which is self-syndicated nationally for the 50-plus crowd. From 2002-2008 he was on staff with the Ventura County Star near Los Angeles. He was earlier with the Marin Independent Journal, San Francisco Chronicle, San Francisco Examiner, Seattle Post-Intelligencer and the Daily News of Los Angeles and was the regular contributing cartoonist for Editor & Publisher magazine from 1995-98. He contributed regularly to the influential blog LA Observed from 2009-2013 and to the Sacramento Bee from 2012-14. Currently he is on staff as a graphic and layout artist for suburban newspapers of the Los Angeles Times. His cartoons have won awards or honors nearly every year of his career, including Citations for Excellence in the 2015, 2007 and 2006 United Nations Ranan Lurie Political Cartoon Awards, second place nationally in the 2015 AltWeekly Awards, the 2010 Southern California Journalism Award (and 2nd Place, 2012 and 2015), runner-up in 2019, 2017 and 2016 Best of the West contests, runner-up in the 2008 Fischetti Editorial Cartoon Competition (behind that year's Pulitzer), Grand Prize in the 1999 Homer Davenport contest, the 1994 Global Media Award for cartooning on overpopulation (awarded in Cairo, Egypt), several American Jewish Press Assn. Rockower Awards, three runner-ups in the Free Press Assn. Mencken Awards, several first places from the Washington Press Assn., Pacific Northwest regional awards from the Society of Professional Journalists, first place nationally in the Center for Defense Information "Star Wars" competition in 1986, and was a finalist in the inaugural Population Media Awards in 2004. His graphics and illustrations have won one solo and five shared Society of Newspaper Design awards and a shared Missouri Lifestyle (Penny Missouri) award. He has had reprints in The New York Times, The Washington Post, Los Angeles Times, USA Today, Chicago Tribune, Milwaukee Journal, St. Petersburg Times, Tokyo's Asahi Shimbun, Time, U.S. News, The New Republic, Sierra and many other publications, plus reprints in over 100 books or textbooks. He has been featured in The Daily Cartoonist, Comic Riffs, Cartoonist PROfiles, The Funny Times, Hogan's Alley (where he is a contributing writer) and other cartooning publications. His originals have been exhibited in cities across the U.S., Canada and overseas, and are in several archives and museums including San Francisco's Cartoon Art Museum, Ohio State University's Billy Ireland Cartoon Museum and Library, the Charles M. Schulz Museum and the Newseum. As a freelance artist, he drew the opening titles for a 1985 summer television series on ABC, "Hail to the Chief," has written for Disney comic books, and written and drawn for Mad magazine.